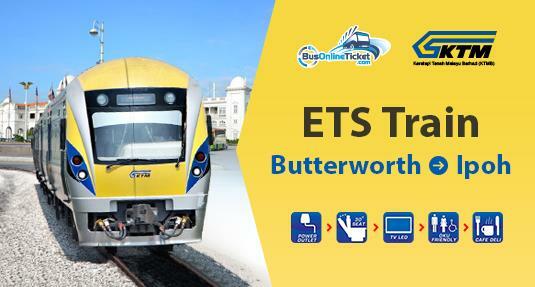 ETS train from Butterworth to Ipoh is one of the hot selling train tickets especially during public holiday. This is due to the highly congested traffic on the highway especially during peak seasons. Hence, passengers usually would book their ETS train ticket online in advance. Many prefer to take ETS train from Butterworth to Ipoh because it is more economical compared to flight. Taking the train also cost less time compared to taking the bus or driving a car. Moreover, one can enjoy the comfortingly beautiful view from the glass window as the train travels across the states. Starting from February 2017, KTMB has announced new schedule for ETS. There are 3 routes for ETS now; Gemas to Padang Besar, Gemas to Butterworth and KL to Ipoh. Check out the duration from other location in our trip duration page. 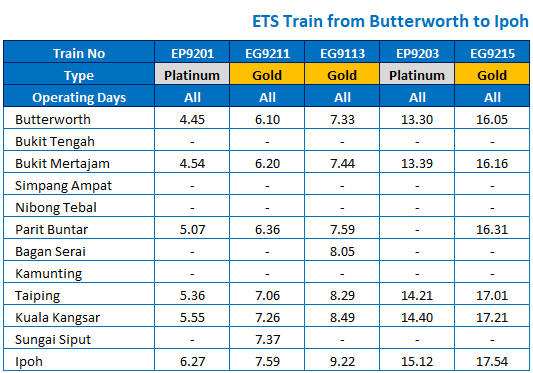 Click to see the stops and timetable for Butterworth to Ipoh train. Below is the latest timetable for ETS train from Butterworth to Ipoh via Gemas-Butterworth-Gemas route, valid from 1st August 2017. Please note that the departing time and the ticket prices can be different from each other depending on the type of ETS train you select. Butterworth Railway Station is located in the mainland of Pulau Pinang. The railway was conveniently built near the jetty and bus station. Hence, passengers can easily switch their transportation mode in the same location. If you are from Penang Island, you can take the ferry from Penang Island to Penang Ferry Terminal in Butterworth. Once you reach the mainland, the railway station is just a couple minutes of walk away from the ferry terminal. The queues may be long in the railway station especially during school holiday. We advise you to book your train tickets online and save the hassle. Ipoh Railway Station is one of the remaining historical buildings in Malaysia and still operates until today. Built in the early 19th century, the architecture of the railway station receives praises among the visitors. Since Ipoh Railway Station is located at the center of Ipoh, it is especially convenient for the passengers who just arrive. However, the only public transport in Ipoh Railway Station you can take is taxi, which you can get once you walk out of the railway station. The charge for the taxi fare might be high. If you want to save money, the city is 30 minutes walking distance from the railway station. Train ticket may be sold out quite fast for this route so it is better to book your train ticket in advance. Book your ticket online and save the cost and hassle from having to go to the station just to buy the ticket. BusOnlineTicket.com offers many payment options to make your booking easier.